The Breakers in Florida is a getaway for couples and families who enjoy seaside activities, including scuba diving, snorkeling, kayaking, or simply relaxing in the sun. This luxury Palm Beach resort offers elegant rooms, a full-service spa, one-half mile of private beach, 36 holes of championship golf and a program for kids. The architecture of the hotel, inspired by Italian Renaissance style, includes twin towers with arches and a landscaped main drive with a Florentine fountain patterned after a fountain at the Boboli Gardens in Florence. The attractively landscaped Beach Club includes four pools, including a childen's pool, ten luxurious pool deck cabanas, 57 beachfront cabanas and a beachfront Jacuzzi, perfect for a Florida beach vacation with the family. Dining options at the club include The Restaurant, The Patio Bar and the S.S. Reef Bar. The 560 hotel guestrooms and suites are luxurious and elegant. Guests can choose from several room categories, ranging from 250-square-foot Standard Rooms to 400-square-foot Premium Full Oceanfront Rooms with private balconies overlooking the ocean and the beach. Suites range in size from 500 square feet to 1,650 square feet. The Flagler Club is comprised of 28 rooms located on the sixth and seventh floors. It includes a private lounge, a club concierge as well as a dining and beverage service throughout the day. The Spa features treatments that incorporate sea and citrus ingredients indigenous to Florida. The spa has 17 treatment rooms and suites. 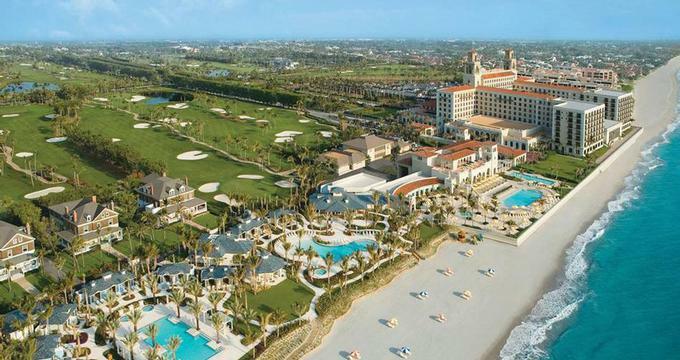 The resort has two golf courses: the historic Ocean Course and the Breakers West course. The Ocean Course is Florida's oldest 18-course, originally laid out in 1896 and completely redesigned in 2000. The Breakers West course is situated 10 miles from the hotel. Ocean Clubhouse is a two-story building designed in a grand old Florida estate style. The second floor of the clubhouse is home to The Flagler Steakhouse, a restaurant with porch seating overlooking the fairways. Adjacent to the club house are 10 Har-Tru tennis courts, lit for night play. The Todd Anderson Golf Academy offers private instruction as well as scheduled golf schools with a personalized curriculum. The resort offers numerous distinct dining options, ranging from elegant to casual. L'Escalier is a sophisticated AAA Five Diamond Award restaurant that serves modern French cuisine. The Tapestry Bar, adjacent to L'Escalier, features an exhibition Wine Cellar with over 1,200 varietals. A variety of recreational options, comfortable accommodations and a number of dining choices make the Breakers a great family destination in Florida. The Family Entertainment Center features an arcade and a toddler's playroom and craft area surrounded by glass windows that allows parents dining at the adjacent Italian Restaurants to see their children. Then there is the Children's movie room and a Computer and X-Box room with desktop PCs and child-friendly games. This kid-friendly getaway has recently introduced the Coconut Crew Interactive Camp that enables children and parents to engage in fun activities designed for ages 3 to 12. The Camp is priced per session or per day. Activities offered include Kids Rule!, a complementary competition event on Saturdays and A La Carte Family Time such as snorkeling, kayaking, golf and tennis. Families can reserve in advance up to five adjoining guestrooms which allows parents to keep kids in close proximity. Children 17 and under stay free in the same room as their parents. Moreover, a guestroom is automatically childproofed for infants or children ages one to three. Each of the resort's restaurants is kid-friendly and children three years of age and younger eat free of charge when ordering from the kid's menu. As Kevin Walter, vice president of food and beverage for the resort, puts it: "Guests thoroughly enjoy our restaurants with their children, as a wonderful backdrop for dialogue and shared experiences." The Breakers offers a $15 million beachfront complex ideal for travelers looking for additional luxury and privacy. Guests can rent Luxury Beach Bungalows next to two new pools overlooking the ocean. The Luxury Relaxation Pool with two whirlpool spas was built for couples looking for a quiet relaxing setting. 20 Luxury Beach Bungalows measure 300 square feet in size with the patio, offering guests a private place to relax during the day. Each bungalow has a full bathroom with a shower, internet, flat screen TV and a safe. Dedicated Bungalow Concierges stand by to fulfill guests' requests (you can let them know the day before what items you want waiting for you). 15 Beach Bungalows are situated around the Relaxation Pool, and five Beach Bungalows are situated around the Active Pool. Advance reservations for daily bungalow and cabana rentals can be made by calling the hotel at 888-273-2437. The glamorous new bar, located in the Breakers lobby, was designed by the renowned hospitality designer Adam D. Tihany (he designed Le Cirque 2000 and MO Bar London). The bar is named after The Breakers' founder Henry Morrison Flagler. It offers an extensive menu of dishes, handcrafted cocktails and over 1,600 wines from around the globe. Vibrant music is selected by HMF's music director. Inspired by the atmosphere of cocktail clubs of the 50s and 60s, a Cigarette Girl offers special tastings and is available to take guest photos. The centerpiece of the bar is a 3,000-bottle Wine Wall made of polished stainless steel and clear glass. The wall serves as a backdrop of the private dining room which seats up to 18 guests, a great idea for a special celebration. Doubles from $275 USD in the spring, summer and fall, and from $435 during the high season which runs from November to mid-May. The hotel offers packages for romantic, golf and spa vacations. The resort is a year-round beach vacation destination with a sub-tropical climate and temperatures ranging from 75 to 85 degrees. Fly to Palm Beach International Airport which is located 7 miles from the resort. Alternatively, Miami International Airport is 72 miles from the hotel. Contact the hotel directly for transportation information from the airport.